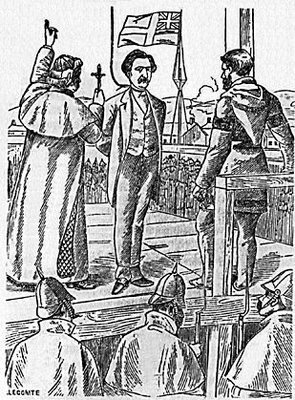 Mental Blog: Breaking News: Louis Riel Hanged! The Lunchbucket Lament has just received word via telegraph that the Métis rebel Louis Riel has been hanged in Regina for his role in the Northwest Rebellion of 1884. Members of the Northwest Mounted Police were deployed in force at the site of the execution and throughout half-breed enclaves all across the western territories to minimize any possibility of unrest or violence. The Prime Minister in Ottawa, Sir John A. A. is reported to have knitted his brow, (the previous brow having become unravelled in the face of insurrection) and murmurred, "Hang the man! He's been no end of trouble to me!" When told, once again, that Riel had been hanged, Sir A. A. nodded and sighed, "Now, if we could only apply the same measures to the Honourable Leader of the Opposition..." Sir A. A. was later seen in the House of Commons, wearing his smartly-striped new brow and sipping ice water from a large tumbler. Mr. Riel was asked his opinion of the hanging. He said, "I agree with A. A. The Leader of the Opposition has got to go." When reminded that it was he himself who had been hanged, he replied, "My lawyer thinks I'm mad as a hatter. But I've never had a problem with my knitted brow. It's the buffalo hair, you see..."
This correspondent fears that the execution of Louis Riel could well have repercussions that will reverberate far into the future, affecting many diverse aspects of the young Canadian society, from public art to the naming of schools to land claims to highways to the publication of histories and mysteries. Perhaps it would not be imprudent to suggest that the Northwest Territories be granted provincial status as quickly as may be practicable, since this will undoubtedly pacify the numerous savages and facilitate the discovery of wheat and oil. An interesting rendition on the death of Louis Riel. A bit random though. Question, are your quotes from John A.A. actual or fictitious. If they are factual your blog could be portrayed as a bit bias, however maybe that is the look you are going for, not sure. Still it creates a bit of confusion for the reader as John A.A. was supposedly quite perturbed as to the Riel situation. While a death sentence would silence the man himself, it had to be realized that the Metis might see him as a martyr which in turn could lead to further insurrection. That being the case, would the death of Riel given John A.A. the satisfaction that the quote is alluding too? Sorry, not being critical just curious. Thanks for the comment Mr/Mrs/Ms Anon. Sir John's quotes are fictitious but delivered more or less (satirically) in the spirit that he might have intended. I'm not exactly being clear here. As I understand the historical situation, Sir John A.A. pushed for Riel's hanging. He was indeed perturbed, and also probably well aware that Riel's execution could create a martyrdom. Nevertheless, he wanted Riel removed. The removal was effective in the short term. It put an end to insurrection. It may have been effective in the longer term too because the Metis have never since wielded the kind of power they did then. But...and it's a big but...the undercurrent still remains. Sir John's actions ensured that. In the paragraph it mentions that Louis Riel had a say in his hanging. Did this mean he wanted to be hung? Do you think Louis Riel is a hero or a villain? Do you think he is sane or insane? Was it right to hang him or should he have lived? I dont think he should of been hung because he was just fighting for his country. I thought this artical was very interestings. This artical rocks! The story about Louis Riel was very good! :D I'm wonderin' how do you know about the officers arriving there? books? old articles? I think that it was a bit weird to read that Louis Riel agreed to himself being "hanged". I also think it was a courageous thing to do. Although that was a very brave thing of him to do, I still think Louis Riel is a bad guy. That was quite an article. Though i found it very odd and strange it was quite entertaining to read and was also funny. In the the paragraph I believe that the death of Louis Reil is a little ridiculous. Wouldn't the Metis people fight a bit more to keep thier saviour safe and stop the hanging of Louis Riel. Did John A.A put this to thought?? I think that the proper information would not really consist so much of the eybrow that Sir John A Mcdonald had, but more of the information on lois riel. this isn't a beauty article. In my personal opinion Louis Riel could have been seen as a hero because he fought for the rights of the rights of the metis people but he could be seen as a villian because he ordered the painful excecution of thomas scott. LOuis Riel IS MY HERO !!!!!!! hello this is a very interesting article:) from all the movies and books i have read this is a very good information sight to look at. the quotes that are said are they ture or did you just put them there from the info that you have seen and discovered from other resources? this is so good that i think you should write more about different things,did Luis reil want to be hung? why did u post a blog on Louis Riel? first of all, "hanged" is not a word. i think. it should be "hung". i think that louis riel had to be a very brave man, for standing up to the canadian government like that. in my opinion, i think he did the right thing by standing up and voicing his concern about the metis rights. although it was a very courageous thing to do, he could have seen this coming, that the government would not stand for it and could have chosen the less violent course. even though i think that was a good thing to do for the metis, he was a little too harsh to thomas scott, putting him in front of the firing squad like that, even though scott was being disrespectful to his guards or something. to conclude this, i do not know if louis riel was a hero or a villain. i agree with both. Hey I dislike the idea of Louis Riel getting hanged becasue he was just standing up for his people's rights and country. I was wondering if you knew more on Louis Riel because if you do then you should add to your article. But no-offense your article is a bit hard to follow. I just don't understan why they could of just made a deal or a comprmise. anyway good article. What was the statement that decided the hanging of Louis Reil. Sorry it doesnt really do in to yourv topic in your article, but just wondering if you new. gow away cowcow!who ever you are. Hey truthfully i don't think Riel should of been hanged. sure he was bad to Canadians but he was just sticking up for Metis Rights. I know that he sentenced Thomas Scott to death, but he did for the safety of his people. Also it must be hard to make so many decisions thatb decide the fate of the Metis. Just think what would of happened if he would of stayed as a humble school teacher, the Metis might not of been able to do anything and would of been forced to assimilate. Either that or they would fight until death. Louis Riel was a great man in my opinion and he tried to help the Metis have some rights. He was not crazy and was great. Your article was very funny and interesting. I am learing about this topic in social class right now and i find it quite interesting also. Louis Riel made a good effort. I think next time you should put a little more humor in it and make it longer. but is it possible you can delete some of these, also do you believe that John A.A was right to hang Louis Reil and if it is fictitious then what states the final decision? Sorry if this makes no sense, just to make it clear. Sorry for some of the random comments on your blog. I am a middle school teacher in Calgary and I am currently teaching my students about Louis Riel. I stumbled upon your website and thought it would be something fun for the kids to read and respond to. The kids do not mean to be offensive or rude, they are just a bit immature sometimes. Hard to monitor 25 12 yrs old in a computer lab. Hope you don’t mind, but your blog was educational and did get quite a response from a few of the students. I suspected I must have been discovered by a class. Thank you all for visiting Mental Blog. I was not offended by any of the comments. I have thicker skin than that. It amuses me to write little bits of fractured history now and then. Naturally, they're not meant to be serious or taken seriously, so don't quote me! You'll get terrible grades!. But I hope you enjoyed reading it and feel free to visit Mental Blog anytime. reading those other comments and I'm glad eye got to put one on this blog. This is quite interesting. All the kids in Mr. Schumack's social class from St. Ambrose School wrote comments eye think. They looked like younger kids wrote most of them. The kids put funny stuff in their article - with HTML tags maybe, so eye maid mine funny two. Words in hear that have homophones eye use the wrong won. Like eye, reel, four, writes, hear, maid, two and won. To those of you who think "hanged" is wrong: You're wrong. The correct term is "hanged", as in "hanged by the neck until dead." I tried to find the origin of the term, but had no luck. Maybe you can Google it and find out why we say "hanged" instead of "hung." In the context of Louis Riel's whole life A) I tell people that he is Manitoba's "Father of Confederation" for he orchistrated that affair completely legally and with respect to Brishish Law. Which probably brought John A to this action 15 years later, he ( John A)didn't want to be forced to do the right thing in this second instance either. from : JOE JONAS !